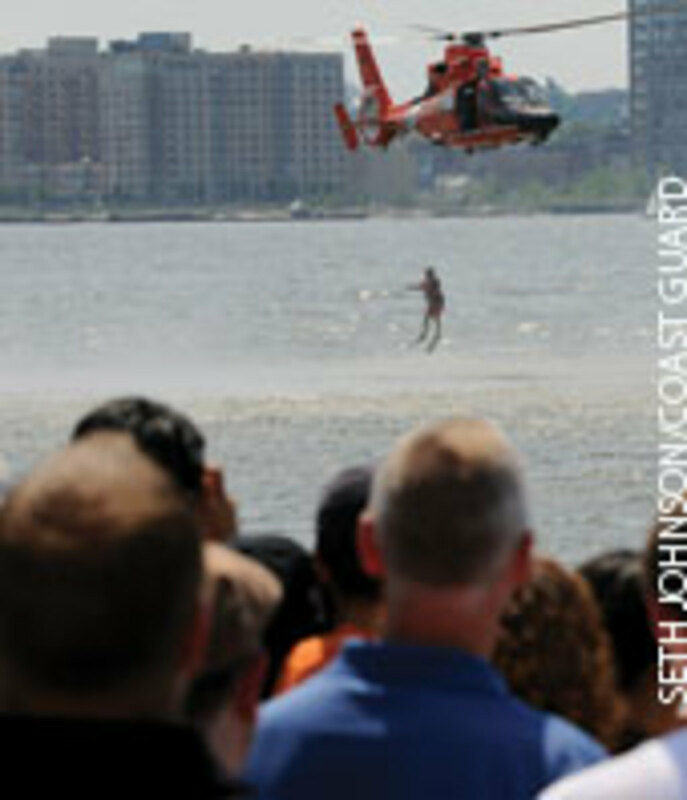 A rescue swimmer from Coast Guard Air Station Atlantic City, N.J., leaps from a helicopter May 30 during a search-and-rescue demonstration at Fleet Week in New York City. 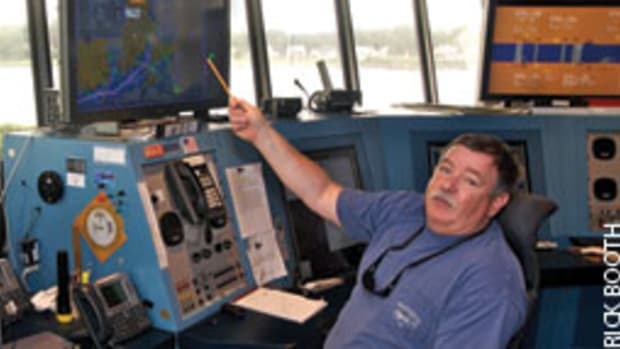 Three boaters who had a personal locator beacon on board were rescued off the Bahamas after their 35-foot express fishing boat flooded and flipped, according to the Coast Guard and the boat’s owner and skipper. 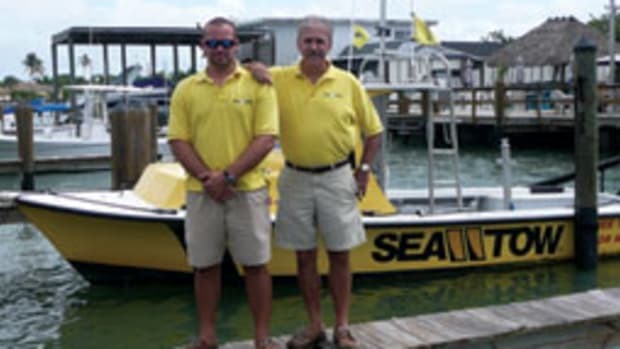 Mandigo’s brother, Dave, 48, of Hilton Head Island, S.C., and Mandigo’s daughter’s boyfriend, Jhade Woodall, of Washington, D.C., were also on board. 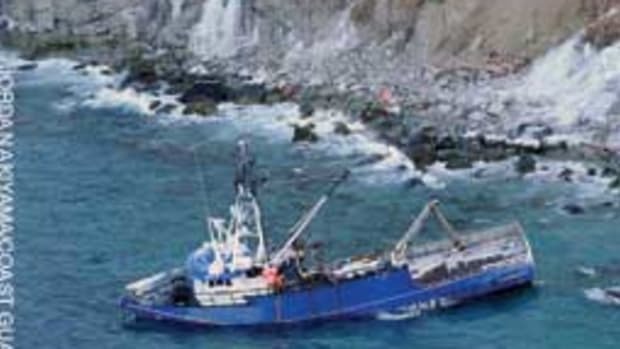 The three men were on a fishing trip and had anchored for the night in about 55 feet of water some 20 miles northwest of West End, he says. 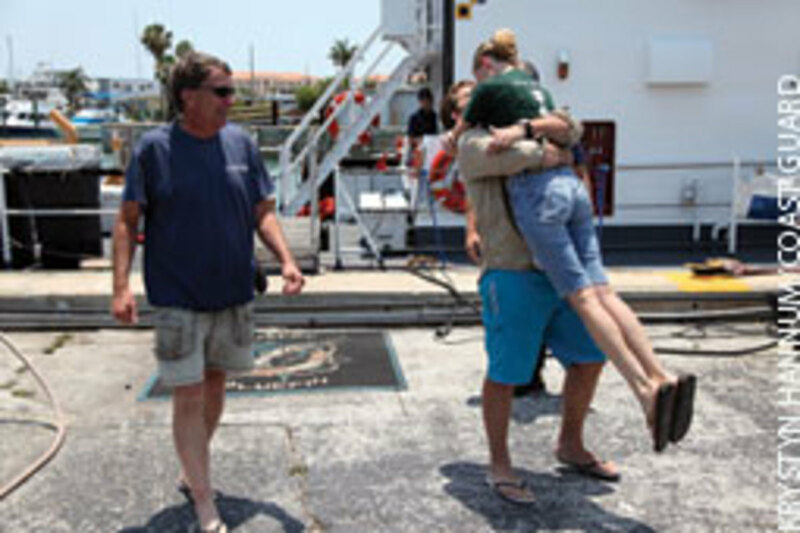 They had left Boynton Beach Inlet at 10 a.m. May 22. 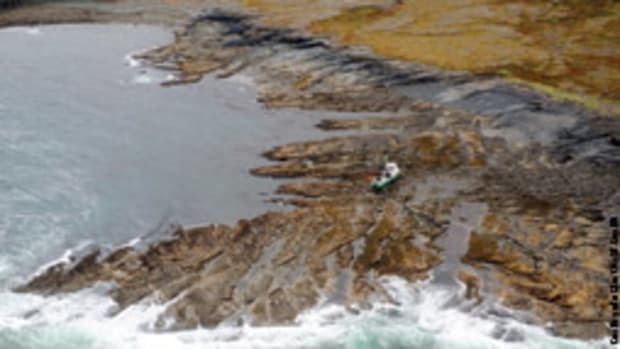 The men spent six hours in the water before they were rescued about 6 a.m. the next day. 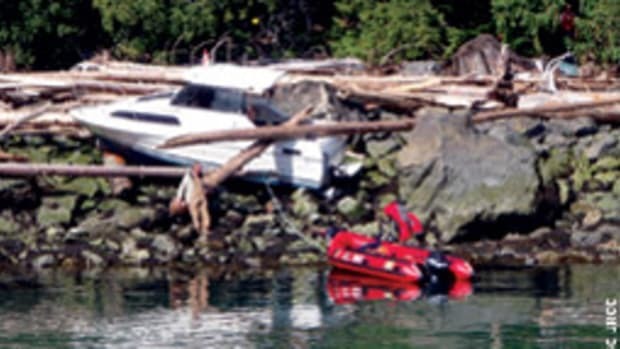 With water gushing under the transom door, the boat turtled in only five minutes, he says. Powered with twin 250-hp Suzuki 4-strokes, the Contender has a self-draining cockpit, but the hatches drain into the bilge, Mandigo says. Mandigo scrambled to gather the flare kit and handheld VHF while his brother grabbed the PLB. The radio was in a compartment that had already flooded, but it was working. “I made a quick mayday call and told them our location,” Mandigo says. With the other two already in the water, he grabbed a spotlight and a cooler for flotation. 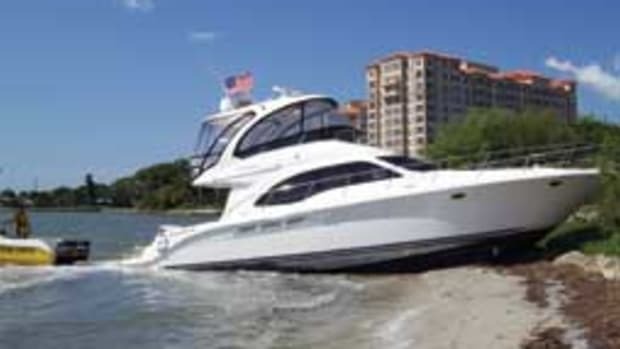 The three decided to separate from the boat, a move safety experts don’t recommend. But the boat had been full of chum and other bait, and the men thought it might attract sharks. Also, it was still anchored, and the current already had pulled Dave Mandigo and Woodall away. Mandigo estimates the seas were about 2 feet and the water temperature in the mid-80s. The men were dressed in shorts and T-shirts. 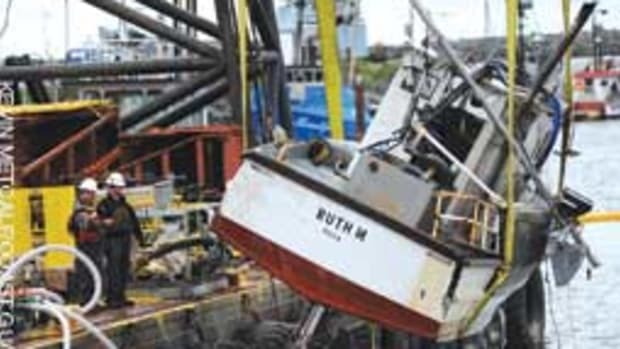 About two hours after the capsize they realized they had failed to successfully activate the PLB. Its strobe wasn’t blinking, and there were no other signs that it was operating. Woodall, who is in his late 20s, was able to read the instructions on the beacon and activate it. The Mandigo brothers had lost their eyeglasses. With the strobe flashing, the anglers “felt pretty confident it was doing its job,” he says. And it was. After receiving the signal, Seventh District Coast Guard search-and- rescue coordinators launched the 87-foot cutter Bluefin and an HC-144 Ocean Sentry aircraft. The aircraft crew found the men and directed the cutter to them. 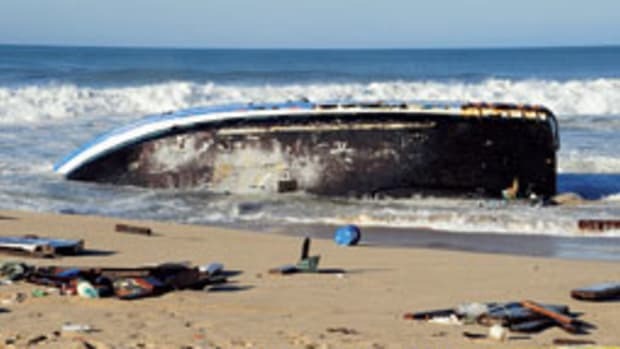 The Contender, which didn’t go to the bottom and is insured, was salvaged and returned to Mandigo. He is unsure whether he will keep it.